"I just know in my heart that its what I should do..."
"Yeah, I know I don't live like I should, but God knows my heart..."
"I know in my heart that God wouldn't send anyone to hell..."
"I know I'm saved because I invited Jesus into my heart..."
That's right; a heart transplant performed by the Lord God Almighty! This would be a good time to seek him for your preoperative evaluation. You'll find it in the Holy Bible. Last month I had the opportunity to attend one of performance guru David Vizard's two day seminars. This series of seminars focuses on David's latest book "How to Build Horsepower." In fact the book is, in essence, a compilation of the lecture notes for the seminar. For those of you unfamiliar with Mr. Vizard, he has been modifying engines for performance for over 50 years. In that time David has proven his proficiency in nearly all facets of performance modification in a wide variety of engine designs with an impressive list of wins, records, and accomplishments. The host for the particular seminar I attended was Myron Cottrell of TPIS Inc. and held at his facility located a convenient 10 minutes from my home. The local event was partially underwritten by Goodson, a top notch vendor of engine rebuilding supplies. In deference to Mr. Vizard and the labor that he has invested in research for this seminar/book, I won't detail any of the specifics from the seminar, however I can heartily endorse it (both the seminar and the book). Truth be told, most of the specifics would be of little value to my regular readers who, like me, tend to be Harley oriented. Don't expect to buy this book and find which particular cam or carb is the correct one for your Harley, however you can expect to find valuable information that will point you in the right direction in a number of areas. As one who has been building performance Harley engines for 30+ years, and porting heads for over 20, I must admit that much of the info in the book is quite basic, but it provided enough of those "Aha!" moments to make it quite worthwhile. In fact, the title I gave to this post reflects that fact. In many ways a high performance engine can be like a jigsaw puzzle. One can work on a single area and pretty much complete it, but it still has to fit into the whole picture in the proper place in order to get the "full effect." Any time you can add another piece of the puzzle, it gives you a better chance of connecting the individual sections properly into the overall picture. Sometimes the new found piece of the puzzle may be as simple as info that explains why a relationship works the way it does. A good example of this from the book/seminar is the relationship between compression ratio and exhaust flow. Another piece might be the widely held belief about exhaust system back pressure which Vizard not only sets straight, but explains how the fallacy gained such wide acceptance. I believe I may have found at least one useful tidbit in every chapter of the book. One of the main reasons for my attendance was to learn about Mr. Vizard's seemingly controversial method of cam selection. During his lecture David polled the audience as to what criteria were the most often used for camshaft selection by their customers. I believe the two most popular answers were duration and the timing of the intake closing. I am a little embarrassed to say that in the Harley industry, one might have to go a little further down the ladder and answer valve lift. Just to be clear, I am not saying those were the criteria that the engine builders present used to select cams, but rather what their customers came to them with. David's answer as to the most important factors in cam selection were quite different. Overlap and lobe centerline angle. For more details, I suggest you buy the book. Perhaps the best reason to read this book lies in its ability to get your brain in gear. How can I apply the knowledge that David has gathered to the engines I work on? Is there a part that can be improved upon with those tidbits of new info I picked up? Suffice to say the wheels are turning (in my head) and more horsepower is within sight on the horizon. I can hardly wait to get back to work on the puzzle. Everyone knows the story of Daniel and the lions den. It is another of those Bible stories that is a favorite of Sunday School teachers everywhere. But, of course, like every other story from the Bible, it is equally edifying for adults. The background to this story is that Daniel was one of those who had been brought as a young captive from the tribe of Judah to Babylon during the reign of Nebuchadnezzar. But soon Daniel and his friends found favor in the sight of the Babylonian rulers. Daniel 6:1-5 It pleased Darius to set over the kingdom an hundred and twenty princes, which should be over the whole kingdom; And over these three presidents; of whom Daniel was first: that the princes might give accounts unto them, and the king should have no damage. Then this Daniel was preferred above the presidents and princes, because an excellent spirit was in him; and the king thought to set him over the whole realm.Then the presidents and princes sought to find occasion against Daniel concerning the kingdom; but they could find none occasion nor fault; forasmuch as he was faithful, neither was there any error or fault found in him. Then said these men, We shall not find any occasion against this Daniel, except we find it against him concerning the law of his God. You see, Daniel had come to his position of importance in the government without compromising or hiding his belief and trust in the God of Israel. How different that is from most politicians today. They will dodge questions and do their best to avoid giving straight answers about their beliefs about God, lest they should offend anyone who might otherwise vote for them. But not Daniel. Knowing that Daniel would not hide his faith, those princes who were jealous of him, found it easy enough to set a trap for him. They went to king Darius and convinced him to make a decree that for the next 30 days no one was to make a petition to any man or any god except to Darius himself. I have to think that they were playing on Darius' pride, flattering him into going along with it. So without considering the consequences for his friend Daniel, Darius signed the decree ...and the penalty for not observing it was to be thrown into the lion's den. Daniel 6:10-11 Now when Daniel knew that the writing was signed, he went into his house; and his windows being open in his chamber toward Jerusalem, he kneeled upon his knees three times a day, and prayed, and gave thanks before his God, as he did aforetime. Then these men assembled, and found Daniel praying and making supplication before his God. Daniel didn't just fall into the trap. He saw the trap as if it were set in broad daylight, and he walked willingly into it! Now, couldn't Daniel have just followed the decree and given up his prayers for 30 days? After all, it would not be a permanent thing - he just needed to take a month off from his prayers. Or he might have even continued to pray, but done it in secret. But there is a phrase in that last passage that make a big difference: "as he did aforetime." Daniel was in the habit of praying 3 times a day, and he was in the habit of doing it with his windows open. Everyone knew he prayed in such a manner. If he had stopped, it would have been tantamount to his denying his God. In Matthew 10:33 Jesus said "But whosoever shall deny me before men, him will I also deny before my Father which is in heaven." By continuing in prayer, despite the decree, Daniel displayed two things. One was that he feared God more than he feared man. He would rather face death than deny his God. The other was his faith that God was able to deliver him, and when I say deliver him, I don't necessarily mean from the mouths of the lions. There is really nothing in the text to suggest that Daniel knew that God would stop the lions from eating him. But we do know that Daniel shared the same promise all Christians have: that no matter how difficult our fate here in this world, we have a glorious future awaiting us in heaven. As Paul said, "... the sufferings of this present time are not worthy to be compared with the glory which shall be revealed in us." Daniel 6:16-23 Then the king commanded, and they brought Daniel, and cast him into the den of lions. Now the king spake and said unto Daniel, Thy God whom thou servest continually, he will deliver thee. And a stone was brought, and laid upon the mouth of the den; and the king sealed it with his own signet, and with the signet of his lords; that the purpose might not be changed concerning Daniel. Then the king went to his palace, and passed the night fasting: neither were instruments of musick brought before him: and his sleep went from him. Then the king arose very early in the morning, and went in haste unto the den of lions. And when he came to the den, he cried with a lamentable voice unto Daniel: and the king spake and said to Daniel, O Daniel, servant of the living God, is thy God, whom thou servest continually, able to deliver thee from the lions? Then said Daniel unto the king, O king, live for ever. My God hath sent his angel, and hath shut the lions' mouths, that they have not hurt me: forasmuch as before him innocency was found in me; and also before thee, O king, have I done no hurt. Then was the king exceedingly glad for him, and commanded that they should take Daniel up out of the den. So Daniel was taken up out of the den, and no manner of hurt was found upon him, because he believed in his God. In Luke 7 we read of the woman who anoints Jesus with costly perfume. That incident ends with these words from Jesus, "... Thy faith hath saved thee; go in peace." In Luke chapter 18 we have Jesus healing a blind beggar, and in verse 42 Jesus said to him, "...Receive thy sight: thy faith hath saved thee." In Mark 16 Jesus tells us: "He that believeth and is baptized shall be saved; but he that believeth not shall be damned." In Romans 10 verse 9 Paul tells us that "... if thou shalt confess with thy mouth the Lord Jesus, and shalt believe in thine heart that God hath raised him from the dead, thou shalt be saved." God has told us, by means of the Bible, that he sent his Son to pay the penalty for our sins. He told us that his Son, who was without sin, died on the cross in our place. Do you believe him? Daniel was saved because he believed God. You too can be saved if you believe God. Back in the old days (or old daze as some I know, put it) drag racing had heavy participation by car clubs. Most often it would take the form of club members "chipping in" in building a race car, which members would often take turns piloting. With the economy in as questionable shape as it has been, perhaps it is time to bring back that particular form of camaraderie. As you know if you follow this blog, I am involved in the fledgling National Vintage Motorcycle Drag Racing Association (NVMDRA). At the moment, the largest hold up with the association seems to be a lack of numbers. Lots of enthusiastic talk, but ready to race drag bikes ...not so much. Perfectly understandable. Had I not started building my "Knuckledragger" project several years ago, I too would be in the same boat, i.e. lots of enthusiasm but not much progress, and it would be largely be due to not having much expendable income for such a project. That always makes the going slow, especially if you are doing your best to stay fiscally responsible. That's where those interested in vintage motorcycle drags could take a cue from those gearheads of yesteryear! What if you and a couple buddies formed an informal drag racing club? Could you get something together to put on the track if it only cost you a third or a quarter as much money? And how about if you only had to devote one third the time to it. Even better yet, if you are an old codger (like me) this would be a good way to mentor a younger guy or two by bringing them in on it. On the other side of that coin, if you and your buddies were not born back in the "dark ages" why not hunt up an old time drag racer to bring on board to show you how it used to be done. I am pretty sure there are a lot of them out there who would jump at the chance to share their knowledge; as long as you are willing to politely listen to their "war stories" that is. Along those lines, I had already contacted my friend Kevin "Teach" Bass, founder and instructor of the Bloomington Kennedy High School "Chopper Class", to see if they would be interested in building a vintage style drag bike as part of this year's curriculum. Teach was enthusiastic about the idea, as he is with almost anything to do with motorcycles. Of course that meant we needed to find a bike to transform into a vintage style drag bike. As luck would have it (course I personally don't believe in luck; I know who is really in charge) a bike found me. A gentleman stopped at my shop last week with a motorcycle on a trailer. Would I be interested in buying it? Depends on the price, was my answer of course. Now, in reality he was looking for a specific shop that specialized in metric bikes. However that shop had recently closed its doors and left no forwarding address. That's right, its no Harley. But that's OK. The NVMDRA is not a strictly Harley association. Nor is it a strictly Harley/Triumph association, though one might jump to that conclusion when looking over the present membership. 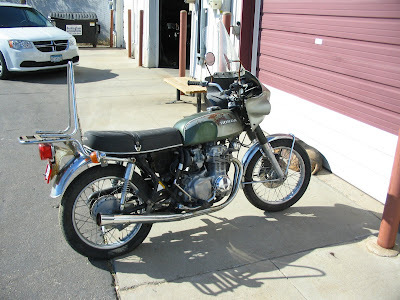 The bike is an early '70s Honda 350 Four. Vintage for sure, and best of all was the initial investment: $50. The seller told me that he thought (rightly I believe) that it was worth about $200 parted out, but when he heard my plans for it, he accepted my $50 offer. That also saved him from hauling it around to other potential buyers since his parents were moving and the Honda was loosing the resting spot it had occupied since 1984. Maybe I have a gift (or weakness, depending on how you look at it) for seeing the potential in an old piece of junk like this. I can already see the bike stripped of a whole bunch of excess baggage. The front fender, fairing, gas tank, seat, luggage rack, etc. will all go (and hopefully be sold on eBay to help finance the project). The swingarm can go and be replaced with a rigid section that will also serve to lower the bike down to a suitable drag race stance. The Chopper Class's new tubing bender should help facilitate that. The front fork can be lightened and shortened and set up with two inches of travel. The front disc brake will be a good item to keep. The speedo can go, but they will probably want to keep the tachometer. The rear wheel is an 18" which would look killer with one of the new run of M&H 4" drag slicks currently in production. Top it off with a vintage look aluminum tube gas tank, and it would be cool as could be. In fact, it'll be all I can do to keep my grubby hands off it and leave it for the high school kids to work on! Yeah, its pretty easy to get one of us old gear heads going. So, isn't it about time you rounded up your buddies and brainstormed about what old relic one of them might know of that would look better and provide more fun if it were transformed into a vintage drag bike?